In the last couple of weeks a number of separate and different policy decisions have emerged. Each one on its own is bad but not overwhelming. 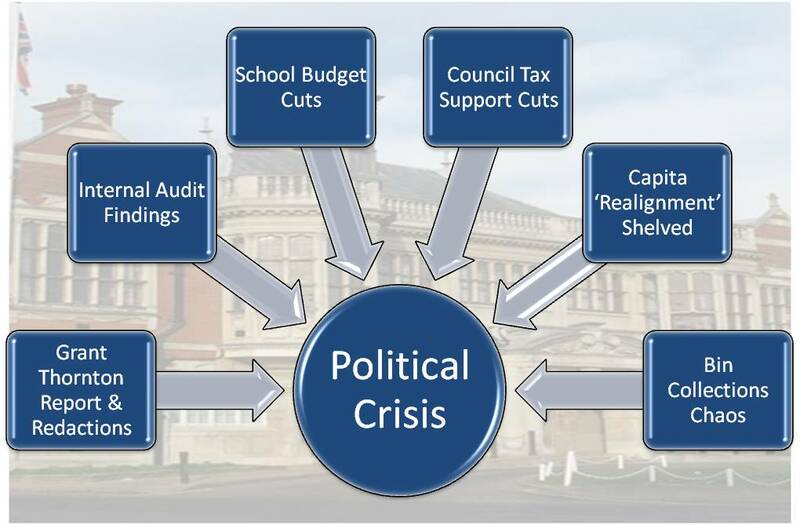 However, as all these different problems come together in the next four weeks, this confluence of events risks leading to a political crisis in Barnet,the likes of which we have not seen in some years. Set out below are just six of those issues. The Grant Thornton report into the £2 million fraud was published back in September but with a large part of one annex heavily redacted. This annex dealt with contractual breaches by Capita. Next week is the Audit Committee at which this report is due to be discussed. I and other bloggers in Barnet have already highlighted the massive failure of systems that allowed this to happen. I blogged about it here, Broken Barnet blogged about it here and the Barnet Eye blogged about it here. Grant Thornton have pulled no punches about the causes of the problems and all roads lead back to Capita. There was an expectation that the report elements that were previously redacted would be made public so we could have a full and frank review, especially around the contract breaches. 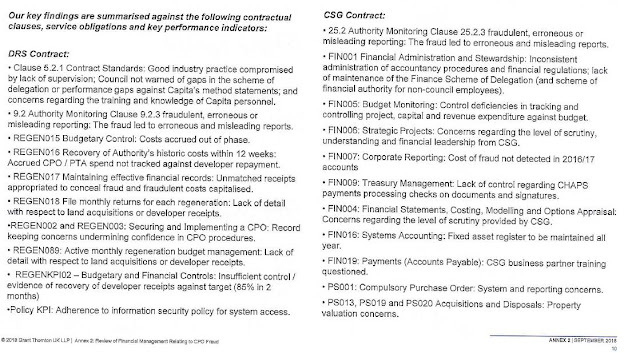 The report lists a summary of the contract breaches and these are set out below. Crucially, the evidence and observations is the part that is redacted. A well informed source suggested to me that the redactions weren't just to spare the blushes of Capita but to conceal criticism of the Conservative group and the way the contract has been managed. At this stage that is just speculation and will only be proven one way or the other when the report is published in full. The big issue here is that by concealing the evidence and observations, democracy is being stifled at a time when key decisions about these contracts are being decided. There are many calls for this to be made available and ultimately this may end up with the Information Commissioner's Office, one of a list of complaints they are dealing with in regard to Barnet, but this is no way to run a 21st century council. Back in July officers set out a series of services where they felt there was scope to improve service performance, value for money and strategic control as set out below. A business case report was commissioned unanimously by the Policy and Resources Committee in July and it was scheduled to come to the next Committee meeting on 11 December. Last week we also found out via a letter from the Council Chief Executive that the Capita Contract 'realignment' has now been shelved. Officers have had nearly 5 months to prepare this business case but it simply hasn't happened. As a result, all but two of the various services that even the Conservative group had agreed should be considered for insourcing will be left with Capita for the foreseeable future. I suspect that this committee will call into question the authority of the Chief Executive to ignore a unanimous committee decision. If it is claimed there have been insufficient resources to complete the study, then I will point out that they allocated a budget of £300,000 for this work so what has that been spent on? I made the suggestion at the July committee that council officers were already busy and that in these circumstances they should bring in external consultants to help prepare the business case. Residents and, I'm sure, many councillors who were expecting this report will feel betrayed and let down by the council and I suspect this will end up in legal action. 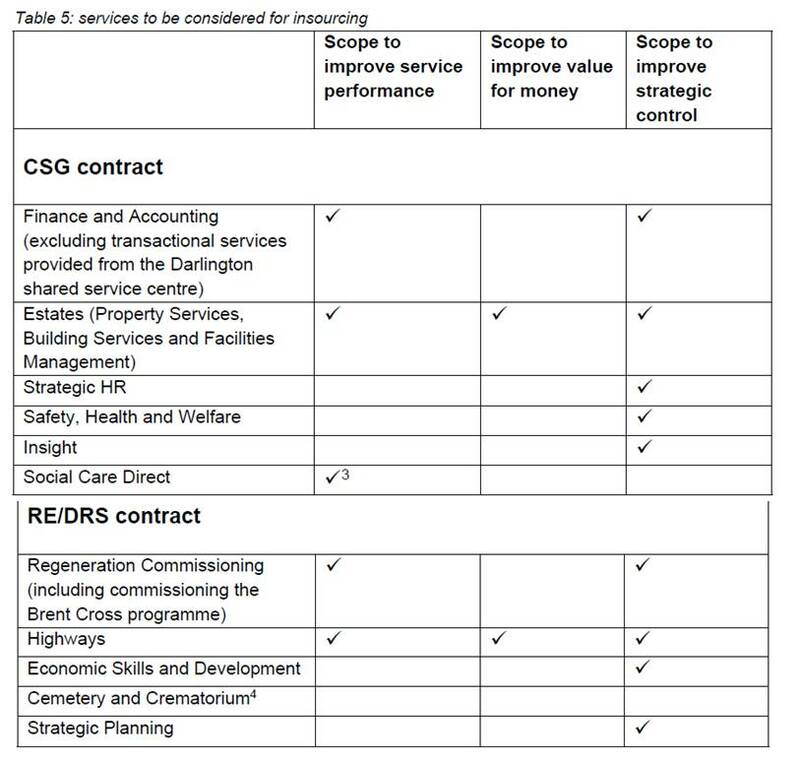 At the Audit Committee next week councillors will also be considering an internal audit report which is shockingly bad with a NO ASSURANCE rating. This documents the failure and mismanagement of the interim and agency staff contract, a contract managed by Capita and on which they have received millions of pounds in gainshare payments. This detailed report is buried away and not listed in the agenda papers. As is increasingly the case, the report can only be accessed via a hyperlink in the officer's summary report which then requires three further click throughs before you can actually read the report. If you want to read it, here is the direct link to the report. Some of the problems identified in 2014 and again in 2015 are still happening in 2018 yet nothing changes. There is always the promise of an action plan to solve the problem but why after five years of failure is this never followed through. I will be blogging more about this in the coming days but it is a catalogue of indifference, complacency and refusal to take decisive action. A proposal to transfer 0.5% of the Schools Block to the High Needs Block. The impact varies by school but for example my local primary school Danegrove would see their budget cut by £25,490, the cost of a teaching assistant. In response 30 Chairs/Vice Chairs of Governors at Barnet schools have written to Barnet Council showing their concern at the situation they have been placed in, the lack of true consultation and the impact it will have on future budget cuts.You can read the response here. We have also seen a consultation on the cuts to council tax support. This is the amount of discount people who are on benefits receive on their Council Tax bill. There may be an assumption that people on benefits get all their council tax paid but that has not been the case for a while. Barnet have used the introduction of Universal Credit to change the discount and rather than make the new scheme cost neutral, they have taken the opportunity to cut £3.2 million from the support budget. This means that if you earn just £10/month on top of your benefits you will have to pay 48% of your council tax. The full schedule is below. You can give your views on the consultation here. This is just going to push even more of the poorest 20,000 people in Barnet further into poverty. The final issue that has arisen is the change to the bin collection service. This seems to have been rushed through with very little consultation with the frontline staff who do the job. There have been changes to collections of refuse from flats above shops and as we know the food waste collections have been indefinitely suspended. The net result has been chaos, with many bins left uncollected. I understand that senior managers were warned that some of the rounds were simply too long to cover in a day and that the number of bins that had to be collected on each route was not known. This is unforgivable. You only have to look on Twitter to see numerous pictures of unemptied bins around the borough. So all this is coming together in the next four weeks and I get a sense that more and more ordinary, Barnet residents, those who are not engaged with social media, those who have no more than a passive interest in politics are starting to question the actions of the Conservative councillors. Brexit may be providing an immediate distraction but on a day to day basis all of these problems are now affecting many more residents. Coupled with the budget shortfall of £66.8 million over the next three years things are only going to get much worse. I also get a sense that not all members of the Conservative party are happy, let alone thousands of residents who are feeling the impact. I get the impression that a gulf is starting to open up between the old guard politicians and some of the new young Tory councillors. The net result for Barnet residents is a badly run council, a weak leadership and poor management. That is good for no one especially the poor, school children, and anyone who believes in democracy. This council is falling apart and I doubt that is going to change any time soon. Will the £4m cheque buy Capita another 5 years?